What Are Lis Pendens and Why Are They Important to Your Property Searches? Whether you are new to real estate or a battle-hardened professional, you likely know that there’s an opportunity to make money working with distressed properties. If you have the skills and/or nerve to take on these kinds of properties, you may be able to turn a profit in this sector as an investor, agent, appraiser, lender, or through some other angle. With this in mind, GeoData Plus provides customers with complete property data on distressed properties in the form of a lis pendens search for real estate professionals. The term “lis pendens” is used frequently, sometimes without a full understanding, so we wanted to provide readers with this handy guide as a lis pendens definition and process primer. By no means is this post an all encompassing guide to lis pendens — in fact, feel free to add your own comments, experience, and insight below if you think they’ll help other real estate investors, agents or appraisers. What is a lis pendens? The term is latin in origin. Lis pendens is defined as a loose translation to “suit pending,” or pending legal action. When it comes to real estate property, a lis pendens is often filed by a mortgage lender when a borrower is no longer making payments. Is this like a 30, 60, or 90-day lateness on a credit report? Not really. While both deal with late payments, a lis pendens doesn’t inherently tell you how late a borrower is, it just means the borrower is late on their payments. A 30/60/90 is credit matter, whereas a lis pendens is a legal matter. How long does a lender wait before filing a lis pendens? It’s up to the individual lender to file a lis pendens, but prior to filing a lis pendens, the lender sends the borrower a Notice of Default. There’s no set number of months a borrower needs to be late before a lis pendens is filed. Where is the lis pendens notice filed? Lis pendens notices are generally filed in the county lands records office. That type of data isn’t typically available online. GeoData Plus gains access to these records, and makes them available along with full suite of property data. Why is information about lis pendens so important? Since a lis pendens is a matter of public record, it’s the first notice to the world that this property may be facing foreclosure. Having this information is invaluable to a potential buyer since it may either discourage them from purchasing the property or use the information to negotiate a price below market value. Being privy to the legal status of a particular property provides a tremendous amount of leverage. How does GeoData Plus Direct incorporate lis pendens into the property data reports? It’s done two ways. GeoData Plus now has a lis pendens search nationwide, adding to the complete property data reports you can get through our platform. The following graphic illustrates the Top-20 Counties in volume of single family homes with a lis pendens for 2017. 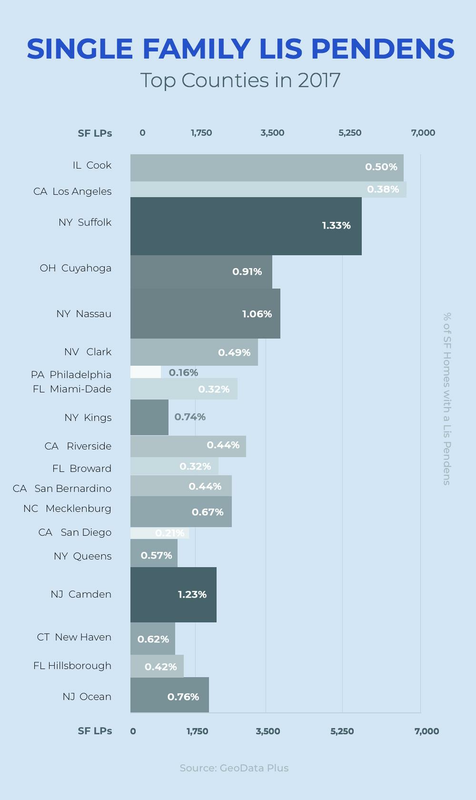 Unsurprisingly, the more populous counties are listed, but take note of the percentage of properties that have a lis pendens, notably Suffolk and Nassau County New York each with over 1% of all single family homes having a lis pendens on them. (infographic) You can search for lis pendens in GeoData Plus by date, neighborhood, and building classification. You can even view lis pendens on our maps. Lis pendens reports are broken down into states and counties. GeoData Plus also alerts you if a specific property has a lis pendens on it when you bring up the individual property report. How far back can I search for a lis pendens in GeoData Plus? You can search our lis pendens data as far back as you’d like. Recently, a customer told me that they used another service prior to signing on with us and he was only able to search back one year. That was surprising to me, especially in this real estate climate where a property can take much longer than a single year to foreclose. How do I take advantage of a lis pendens? That depends on what you’re trying to do. A real estate investor is going to want to try to get in touch with the owner in an effort to buy the property. A real estate agent will also try to contact the owner but in an effort to list the property or introduce them to a buyer. If the amount of the mortgage is more than what the property will sell for, you’ll need to negotiate a short sale with the bank. In summary, a short sale occurs when a property sells for less than the sum of the mortgage balances. You’ll often need lender approval to complete a short sale. How does a real estate appraiser benefit from seeing lis pendens? Here’s one example: an appraiser will receive an assignment to appraise a home for the purpose of a mortgage. The client (in this case the mortgage lender or appraisal management company) may not know the property is facing foreclosure. When the appraiser looks up the property in GeoData Plus, he or she will see the lis pendens and be able to share it with the client. This can save their client a great deal of time, money, and trouble, while making the appraiser look like a hero. Regardless of your real estate profession, the distressed real estate market has been around for a number of years and continues to play a significant part in the real estate economy despite every prediction to the contrary. Whether you’re actively pursuing these types of properties or not, this is information you really need to know. GeoData Plus makes this property data readily available for properties nationwide.